Here are the warranty information for Osaki, Titan, Apex and Galaxy brands. You can also find the information on the warranty tab of each product. If you don't see the information, please inquire us. Please refer to the manufacturer's website for other brands not mentioned here. We guarantees that your qualified product will be replaced or repaired at our option, without cost to you, should it be deemed defective because of faulty parts, workmanship or structural defects during the first FOUR (4) years of ownership, excluding specific limitations contained herein. This warranty includes parts costs and labor for the first (2) years at no cost to the customer. This warranty includes parts costs covered for the 4 years at no cost to the customer. 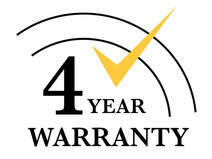 This warranty is only valid with the purchase of the extended 1 year warranty. Any implied warranties shall be limited to the duration of the 2 year portion of this limited warranty, and with regard to structural framework, limited to the duration of the 3 year portion of this limited warranty. We guarantees that your qualified product will be replaced or repaired at our option, without cost to you, should it be deemed defective because of faulty parts, workmanship or structural defects during the first FIVE (5) years of ownership, excluding specific limitations contained herein. This warranty includes parts costs and labor for the first (3) years at no cost to the customer. This warranty includes parts costs covered for the 5 years at no cost to the customer. This warranty is only valid with the purchase of the extended 2 year warranty. Any implied warranties shall be limited to the duration of the 3 year portion of this limited warranty, and with regard to structural framework, limited to the duration of the 3 year portion of this limited warranty. The manufacturers provide 3 year parts-only warranty for all vending massage chairs. Small items such as handhelds, foot massager, leg massager, smaller size massage chairs, chairs or other items have 90 days parts warranty otherwise mentioned in the product page.